How cool is that?! Emily at The Ashdown Bloggin' Blogger Blog decided that my blog was noteworthy enough to include it in her list of lovely blogs! She is one talented photographer, designer and blogger - I am honored that she would visit my little corner of the blogosphere and even more so that she would comment. Thank you Emily! 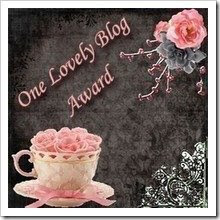 The rules of the "One Lovely Blog Award" are: Accept the award, post it on your blog together with the name of the person who has granted the award, and his or her blog link. Pass the award to 15 other blogs that you've newly discovered. Remember to contact the bloggers to let them know they have been chosen for this award. 1. Rachel at LAWN TEA is one of the most talented writers you will ever have the pleasure to read! 3. Dorky Dad cracks me up - am always excited to see a new post from him! 4. G at Doves Today - I live vicariously through her and her travels! 5. Fresh Confessions of a Screwed Up Texan - her site has really grown since I first started visiting. Love her open honesty and her photos. 6. Leia at Monkeys Jump doesn't post regularly but has a sense of humor that appeals to me and her photography is inspiring! Oh, and she happens to be my oldest daughter, too! Her flickr page contains some of the coolest captures you'll see anywhere! 8. Mrs G at The Women's Colony - I want to be her when I grow up!! God Bless Mrs G and her Cabana! 9. You all need to take a trip "down under" and visit Merle at Merle's Third Try she is sweetness personified! 10. Josh at My Crappy Photography - it is anything but crappy! His work inspires me to try different things. The world through his lens is breath-taking! 11. Ree at The Pioneer Woman - while I discovered her years ago, there is no way I could leave off my favorite website EVER! I have learned more from her photography posts and gained more pounds due to her cooking posts. We have lots in common and one day I WILL visit the Lodge, and we'll sing John Denver and Carpenters songs on that gorgeous deck. 12. Donna at Quiet Life has the most beautiful way of looking at life - it shows in her blog and her photos! 14. Karen at The Rocking Pony. Love her and her family. She has the BEST stories! 15. The More, The Messier never fails to entertain! Hope you have time to visit and hope you enjoy them as much as I do. Don't forget to leave some comment love. Thank you SO much Sweetpea!!! What a lovely thing, and it's my first ever AWARD as well. I did not know about this site, somehow, and kept coming back to the other to see if it were posted yet. Couple that with yesterday, when one of those "widget" sites chose Lawn Tea as one of its random "sites of the day" and the HUNDREDS of visitors as the clicker counted off like the water meter when you water the lawn. PLUS---for the first time EVER, our server went down and was off for almost four hours---maddening when I could not get on the 'Net and knew all those names and places were flying by and I'd never see them, never know what exotic cities and flags were appearing on my "I'm here" counter. Anyway---I must gather my thoughts for the fifteen THINGS, as well as probably ask you how to post that neat picture on my own site. I don't know about click-and . . . yet. Could you e-mail me the how-to? And to be included with the likes of Mrs. G.!!!! and Ree---well, I don't know how to respond to that. Wow. And Thank You!!. I'll be looking in on your other choices, as well, for I trust your taste and your friends implicitly. What a sweetie you are, and I hope all is well with you and the Grands, especially Mr. Concweet. Hope you have a fine weekend for Waterman's soon. Thank you for the award! I love it when readers show their fondness for my blog--it's y'all that keeps me going on. Thank you for the award. I'm in august company on that list. Dear Kathy ~~ What a lovely surprise. pleased to accept it and will post it on my blog as soon as possible. I didn't know you read my posts even. Kathryn - Kathy and she called her daughter Kate. So that was confusing for a while. Take care, Love, Merle. Thank you...you sweet thing. It is an honor to be listed amongst such wonderful women bloggers. Thank you so much for the shout!